Stepping out of Yuly’s Bakery, this is what you see across the street. Far be it from me to invite, by harping on old news, recollections of Cato the Elder. It was that Roman conservative, you may recall, who ended every public speech with the immortal phrase “Ceterum censeo Carthaginem esse delendam.” While Cato harped on the need to destroy Carthage if the Roman republic was to survive, I am returning to a far less momentous development, or non-development, of which I am reminded every time I emerge from Yuly’s Bakery in the Carriage House Plaza clutching a bag of Mexican pastries. As I step from the bakery thinking of sugar and cinnamon, my eyes cannot help but fall on the old Salvation Army thrift store across the street, vacant and boarded up for at least the last six years. Seeing it there, I am reminded once again of the Albany City Council’s recent decision killing a chance to give the old building an upgrade and new use. 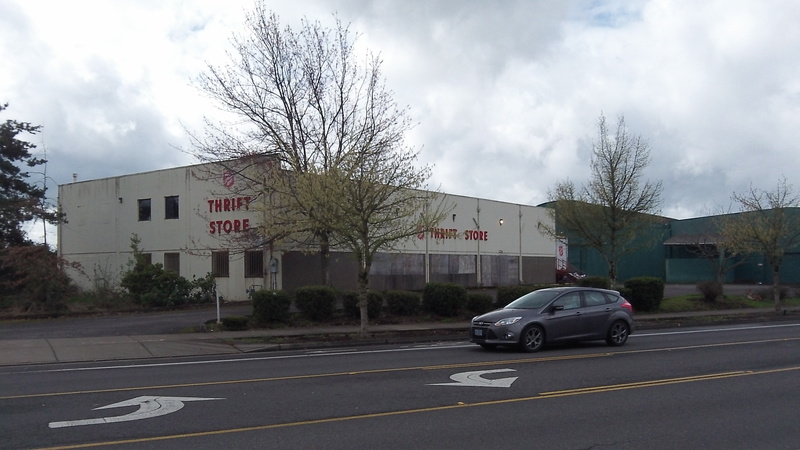 The Oregon Beverage Recycling Cooperative wanted to buy the property and turn it into a bottle and can redemption center without requiring a dime of urban renewal financing or other public aid. But Albany’s interpretation of the zoning code was that as a business with a potentially regional clientele, the redemption center was not allowed in that spot. And the council refused to approve a change in the code to allow it. So the empty building sits there, still for sale, still empty, still unused, an invitation to urban decay. Hopefully Hasso’s comparison to Cato doesn’t come true. I’d hate to think that change will come only after the city’s opposition dies off. The article preceding this one has a more direct connection with me, but this article highlights a point I plan to bring up tonight. The Council voted 4-2 to stop the rezoning, supposedly because of dissenting opinions. At my count, there were 7 or so dissenters and this amount was enough to sway the vote. So tonight, the city will be considering banning medical marijuana dispensaries and I guarantee there will be more than 7 dissenters to a ban. If it took 7 people to derail the zoning change, how is 200 not enough to derail a ban? I’m hoping Mr. Collins, Mr. Coburn, Mr. Kopczynski, and Mr. Olsen do the right thing tonight and listen to the people, as they claim to have done with the zoning change of the redemption center. Tonight is the true test on if the council really did bar the redemption center because of public disapproval. If the ban on dispensaries goes through despite such overwhelming public disapproval, it could be extrapolated that the redemption center was also killed regardless of public sentiment but on some other agenda. I’m not one to be inclined to lean towards conspiracy, but, again, a ban tonight in the face of overwhelming opposition casts doubts on any claims that the public has sway. Do the right thing councilors.